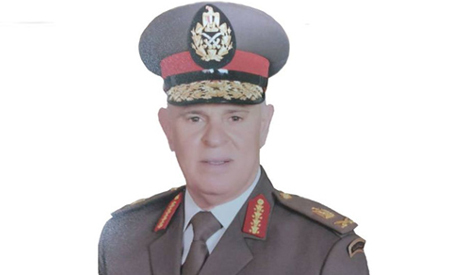 Egypt's Armed Forces Chief of Staff, Lieutenant-General Mohamed Farid Hegazi, met on Sunday with a number of army officers who have been nominated to hold various leadership posts, a statement by the armed forces spokesman read. Egyptian armed forces spokesman Tamer El-Refaie said the chief-of-staff stressed that the military is executing with full force a comprehensive confrontation to extract the roots of terrorism from Sinai and establish a suitable atmosphere for stability and development, saying this is the responsibility of every member of the armed forces. Hegazi said that the circumstances and challenges faced by Egypt impose a need to maintain high levels of vigilance, readiness, and good training for army fighters, scientifically, physically, and psychologically, as well as the need for continuous communication with army personnel. He said the general command is keen on preparing and selecting leaders at all levels so they can execute missions through developed thinking and in accordance with accurate scientific methods that can accomplish mandated missions and responsibilities. The chief of staff called on the officers to continue their research in military and civil fields, uphold military discipline, principles and the high ideals of the Egyptian military in order for the forces to fulfill their commitment for Egypt and its people.